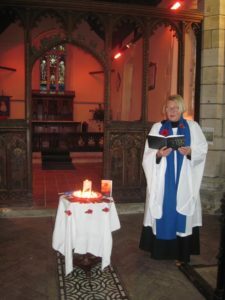 Sixteen people gathered together on Sunday afternoon to pay their respects to all those from Trimingham who gave their lives in the two world wars. Terry Brown read out all the names while Sheila Olley lit a candle for every person who was lost, and read a reading. Ted Briggs, despite illness, still managed to come and play the Last Post.